It’s 2:45 AM and the alarm is blaring rambunctiously! While its rhythmic wails may seem like a serious miscalculation, neither Russ or I seemed to mind its rude awakening. We hopped out of bed, bundled up, brewed coffee, and grabbed a snack before heading out the door. We immediately looked upward to check out the skies. The clear midnight blue sky was glittered with stars which is just what we were hoping for. We hopped in the car and headed for Acadia National Park with our ultimate goal the summit of Cadillac Mountain. We saw very few cars until we reached the turn onto the 3.5 mile segment of Park Loop Road. As we approached, we were shocked at how light the sky already was in the easternly direction. 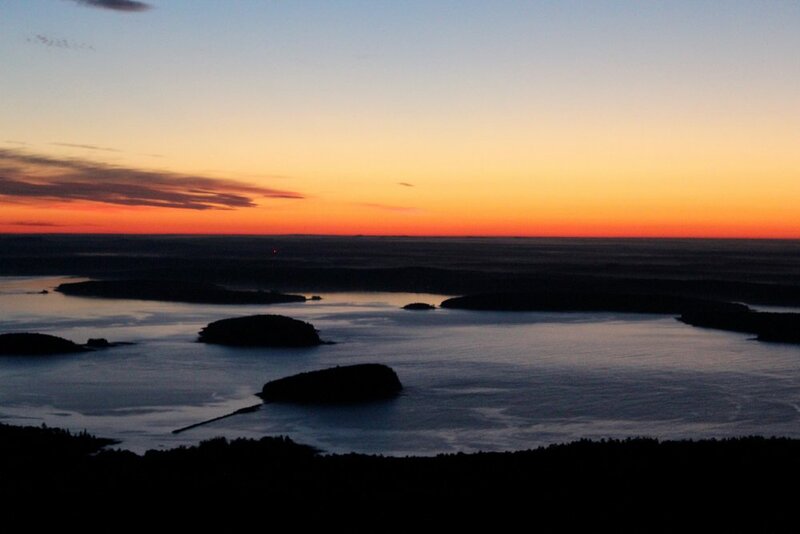 The moon was casting beautiful light on the waters of Frenchman Bay while the Porcupine Islands were still dark against the colorful light in the sky. While we did see some lights from the town of Bar Harbor below, the lights were at a minimum due to the light ordinance in place to protect the night sky from light pollution. When we arrived, we were part of a group of 20-30 people. We parked and headed toward the open granite surface of the mountain. We found a seat, plopped down a blanket and put on our stocking hats to enjoy the show that Mother Nature was broadcasting for the day. We snapped photos and chatted as we watched the clouds and colors of the sky change drastically. We were shocked when we turned around to see the hundreds of people that had gathered behind us over the last hour! It was amazing how quietly everyone remained as the darkness behind us gave the sensation of nighttime while the colorful skies gave first signals of the daybreak. With Cadillac Mountain standing at 1,532 feet, it checks in at the highest point on the North Atlantic seaboard. Due to its location, it is the first place to spot the sunrise during the fall and winter months. Mars Hill, ME which is slightly to the Northeast gets that claim during the spring and summer months. So while there may have been some people who spotted the sunrise before us, we aren’t going to get lost in those silly details. As the first glimmer of the sun broke the horizon, we were amazed by its brightness. With the reflection off the water, we were actually glad we had our sunglasses along. It felt strange to have my sunglasses on at 4:45 AM. The sun was fully above the horizon exactly at the day’s sunrise time of 4:49 AM. It wasn’t until the sun was fully risen until you could hear the noise of the crowds that had gathered atop of Cadillac. Along with people’s clapping were people chanting “Happy Summer Solstice” and “Welcome Summer”. We throughly enjoyed the first sunrise of the summer on June 21st which also hails as my birthday! What a lovely way to start any day, but especially one that is known for the most daylight! Happy Summer Solstice & Happy Birthday to me! 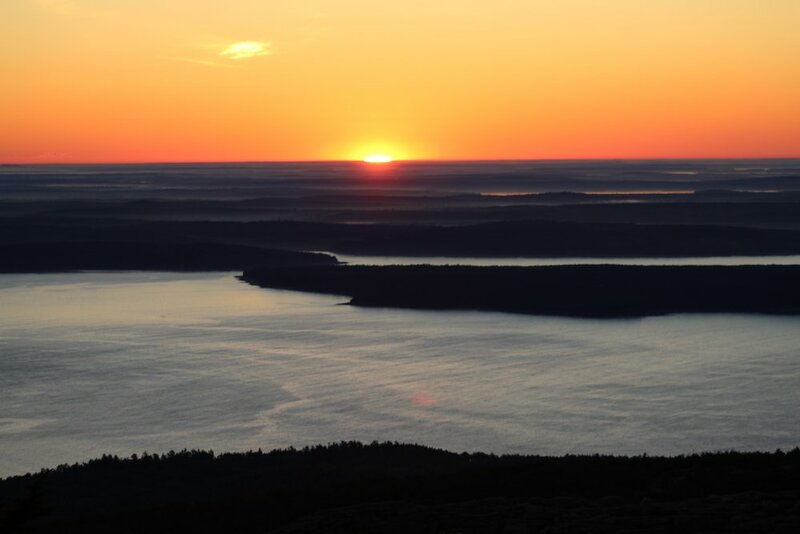 We do plan to enjoy another sunrise atop of Cadillac during our stay here in Maine. We may even try to combine it with a late night star-gazing session. After making our way back to the car, we headed straight for breakfast at Jeannie’s Great Maine Breakfast. This breakfast joint is known for opening at sunrise for people just like us who enjoyed the views atop Cadillac Mountain. A tasty egg & cheese croissant for the birthday girl and gluten-free pancakes for my date and we were all set. A short drive back to our campground and within minutes we were tucked into bed for a nap before anyone was even stirring at the campground. Russ headed into work that afternoon while Karen & I took a birthday hike on the Ocean Trail. We found a lucky parking spot at the crowded Sand Beach parking lot and started off to the trail. Along the way, we enjoyed the sights and sounds of Thunder Hole and the spectacular views at Otter Cliffs. It was just about a perfect weather day for a lovely afternoon walk. Thanks for the fun times to my hiking partner, Karen! I spent the rest of the afternoon relaxing before heading into town to pick up Russ after finishing his sunset kayak tour pickups. While my birthday had been absolutely delightful, it was missing one single thing - ICE CREAM. We headed to Ben & Bill’s Chocolate Emporium in search of the missing puzzle piece. Double Cookies N’ Cream for me & Macadamia Coconut for Russ and the 35th Edition of the Birthday puzzle was complete. Thanks to all my friends & family that made my day extra special.